The 800-year-old Salisbury cathedral, as ancient and imposing as it is, didn't originally stand where it is today. 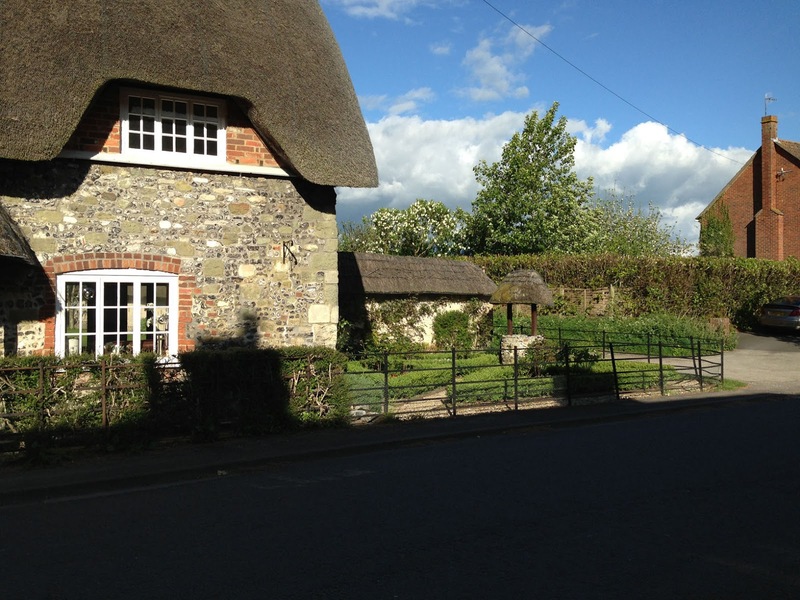 Salisbury town was once called "Sarum", and stood a few miles north of the present site. The hilltop castle town of Sarum was in use from Celtic days, and further used by Romans, Saxons and Normans. The cathedral was enclosed within the moated castle-town, which caused constant conflicts between the bishop and the castle-lord, who ran the fort. 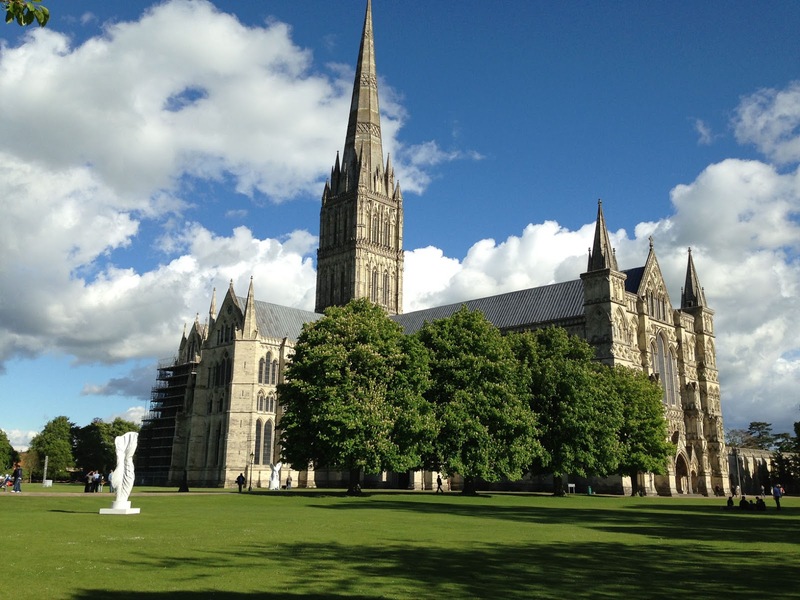 So, in the 1200s, a new site for the cathedral was found two miles to the south, where the church could go about its business free of intervention of the castle masters, and Salisbury was born. 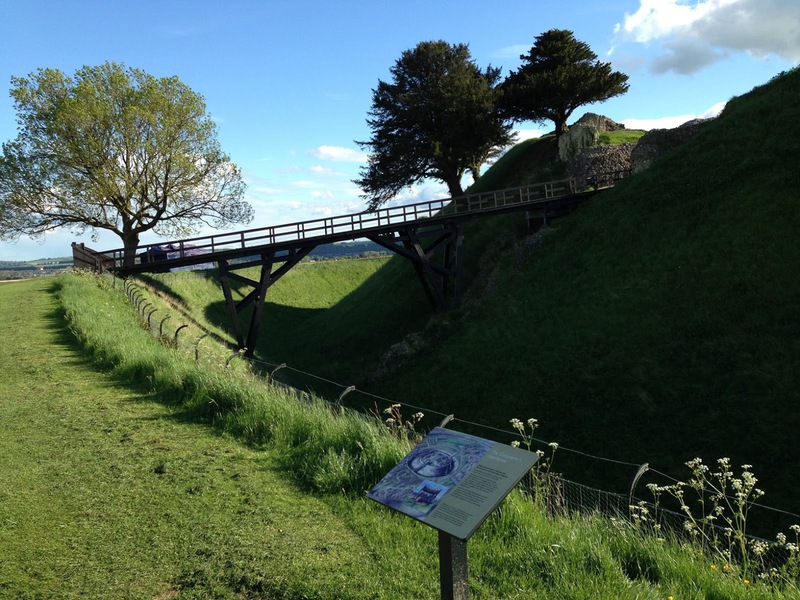 Legend has it that an archer shot an arrow from Sarum, and where it landed, the new cathedral was built. Eventually, the whole town moved to the new site, and they re-used the old stones, leaving only foundations still standing within the Old Sarum walls. This run will retrace this old connection, starting at the cathedral and heading north to the original spot, where ruins of the old castle and church are visible behind the still-impressive earthen walls. 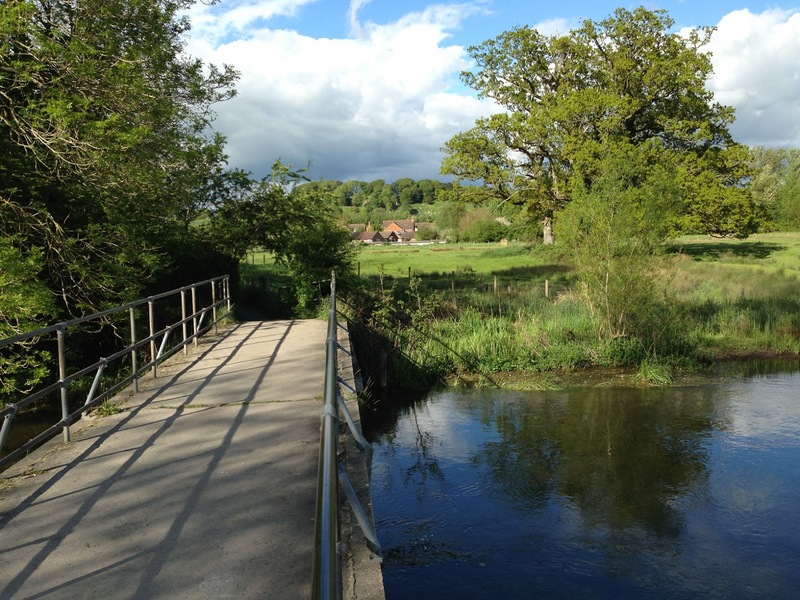 The route will first run through a bit of the old town, then follow the River Avon northwards through town and then out into open fields before turning eastwards to visit Old Sarum, and then head back the same way. 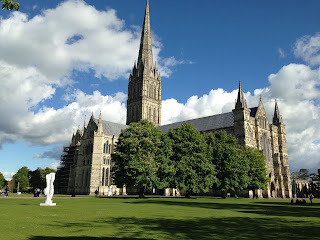 Start right in that huge, wonderful Salisbury Cathedral churchyard, with the delicate gothic spire soaring into space above the gigantic church, with the endless lawn setting it off. Turn north and run out the gateway on the north side of the cathedral quarter, taking you directly into the High Street. Run past the shops for a block then turn left onto Crane Street and run down to the River Avon, with its old stone bridge. 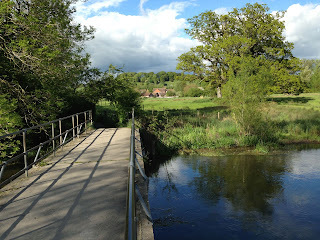 You'll see a path turning right at the "Compleat Artist" shop to continue northwards, with the water to your left side. Take that path. 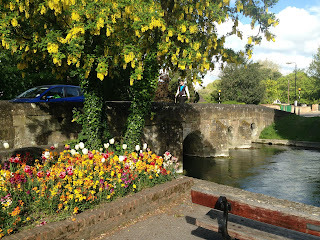 You'll run past the town center for a few blocks, crossing the river. You'll go past a clock tower, more shops, a parking lot, then go under some road bridges. And then the river will curve to the left, heading into some open fields. The path will still stay along the riverside, on the left side of the water. Then, after going past the first big lawn, the river curves to the right. 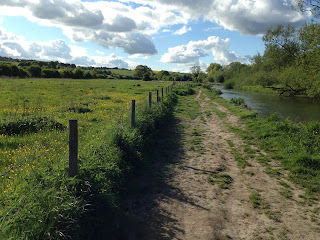 Immediately take the path that stays directly along the river, leading you along a dike at the riverside. Keep along the river. After the dike, the path enters a wildlife preserve, and the trail turns into a boardwalk. Later, it turns into a barely visible trail directly next to the river. 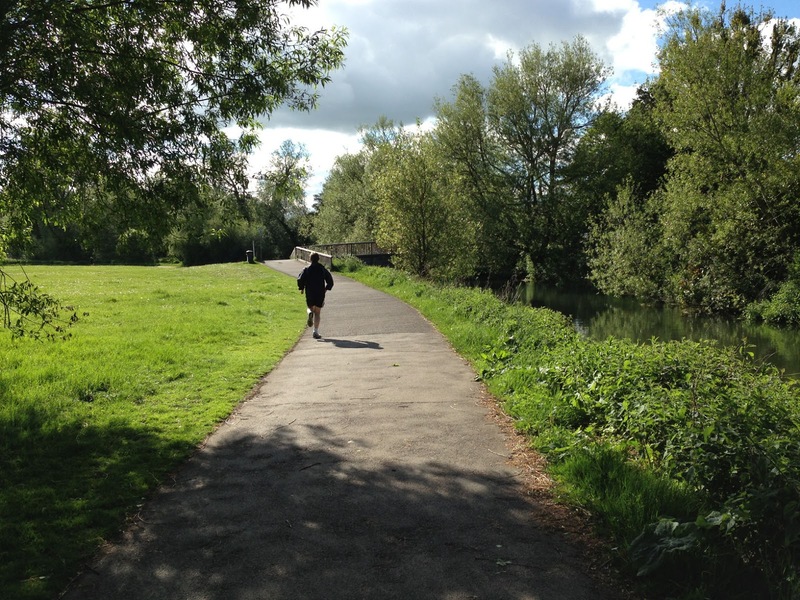 At one spot, you are forced more to the left side, when the path goes around some riverside fields. 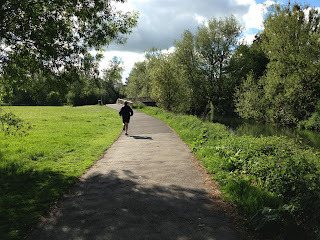 You will now run through fields, perhaps 50 meters to the west of the river. After 3.5 km, you'll come to a little paved footpath that crosses your path. Turn right here and cross the footbridge that leads across the river, to the right, heading east. 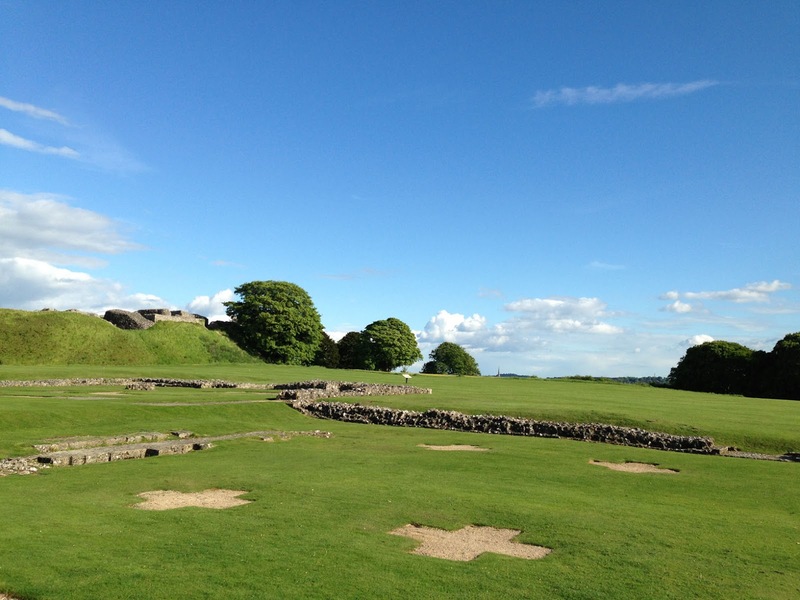 You will see the hilltop fortress of Old Sarum rising up in front of you on the horizon in the distance. When the path ends at a street, Stratford Road, turn right and run past about 5 cottages, where you turn left onto the first public footpath leading to the hill, just past the stone cottage with the thatched roof. Now follow the public footpath as it heads uphill. You will come to a spot where the trail forks. Take the trail to the right, going through the metal gate, curving to the right. You will follow a hedgerow as it goes a bit uphill. NOTE: Watch your footing: it is very uneven going from here on. Watch out that you don't twist your ankle. 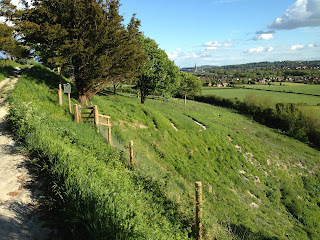 Continue following the footpath as it circles the hill along the right side, going through several gates, then coming close to a road going past the main entrance to Old Sarum. Now head straight up to the entrance, with a paved road into the walled fortress. In the evenings, the gate is closed, but you can just run past it. Many runners and walkers go up there in the evenings. The ruins are only officially open during the daytime, and you have to pay to get in. So do that if you please. 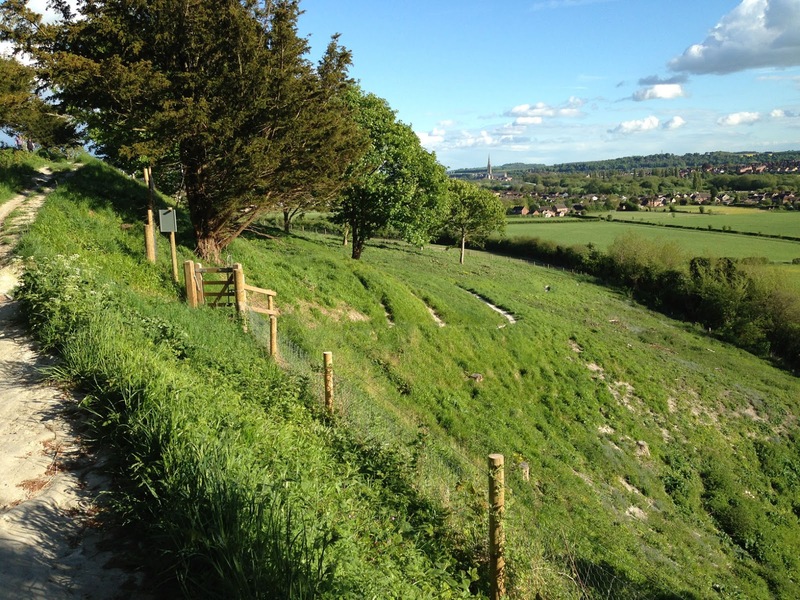 Otherwise, this route will take you into Old Sarum without paying. The inner castle is blocked off in the evenings, so you can run along the right side until you reach the foundations of the old cathedral. Now exit the other way out of the fortress, heading west down the little path, through the moated walls. Turn left on the path atop the outside wall and run to the second little path that heads downhill. This path will eventually hit the path where you came up the hill, where you first went to the right. Now just run downhill and follow the same way home that you followed earlier.